As you’ve probably heard by now, Jan 28, 2015 is the day to talk about mental health and to end the stigma associated with mental health. I’ve watched the new one-hour documentary about Clara’s Big Ride. It is a moving look at the coast-to-coast bike journey of six-time Canadian Olympian, Clara Hughes, and ten people who have mental illness. I really think everyone should watch it, too. You can watch it now online and on-demand on Crave.TV and CTV.ca. It also airs tonight on CTV at 7pm EST. There’s 5 simple ways to help end the stigma. *Bell’s donations are made at no extra charge to Bell Let’s Talk Day participants, though normal long distance or text charges, if any, apply. 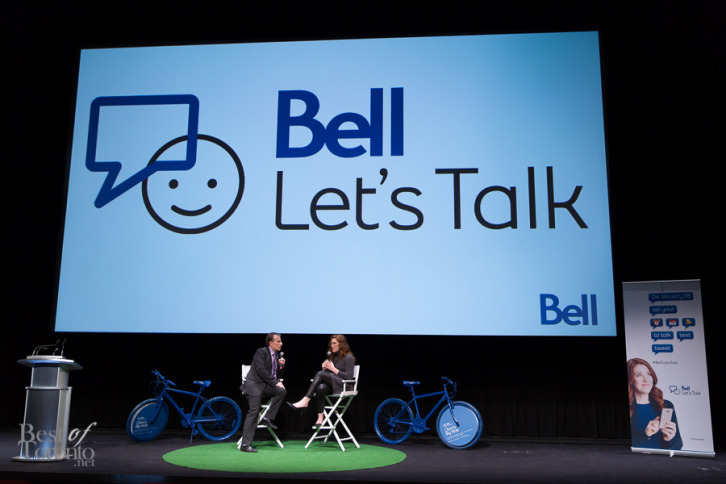 Bell said they aim to make this year’s Bell Let’s Talk campaign bigger than ever, possibly raising up to $7 million for mental health initiatives. Want to help someone in need? You can download the Bell Let’s Talk toolkit here. Here are my photos of last night’s kickoff (Jan 27, 2015) at TIFF Bell Lightbox and Malaparte. In attendance were Clara Hughes, Adam van Koeverden, TSN’s Michael Landsberg, Mayor John Tory and Premier of Ontario, Kathleen Wynne. It was also great to meet and talk first-hand with the ten featured in the Clara’s Big Ride documentary.